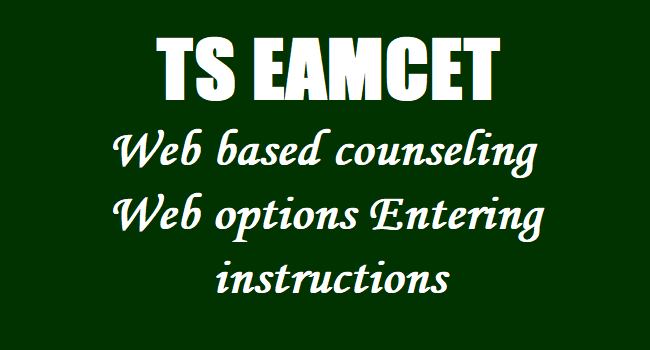 TS EAMCET 2019 Certificate Verification Instructions have been issued for the Qualified Candidates. After completion of verification of certificates candidates should follow the instructions for entering the web options. * జూన్ ..వ తేదీ వరకు: వెబ్‌సైట్ ద్వారా ట్యూషన్ ఫీజు చెల్లింపు, కళాశాలలో చేరినట్లు సెల్ఫ్ రిపోర్టింగ్ చేయడం. Can U Plz. elaborate on entry of options? Can we enter any no. of options with order of our choice like 1, 2,3 etc? i am not gettiig OTP , entered my details somay times ...what should i do? please help me..
yes, you can enter any number of options but keep in mind, the order is important!! We are not receiving any OTP. Any alternative? Please provide solution to improper logout. Options are not saved and now allowing to login again. How to change my options on 22 and 23 ? Can I do it from home else will I have to go to any help line centre? Sri am not getting OTP to my registered mobile number , pls help me I didn't enter options.